You are here: Home / Best Apps for Toddlers / Best Apps for Toddlers! 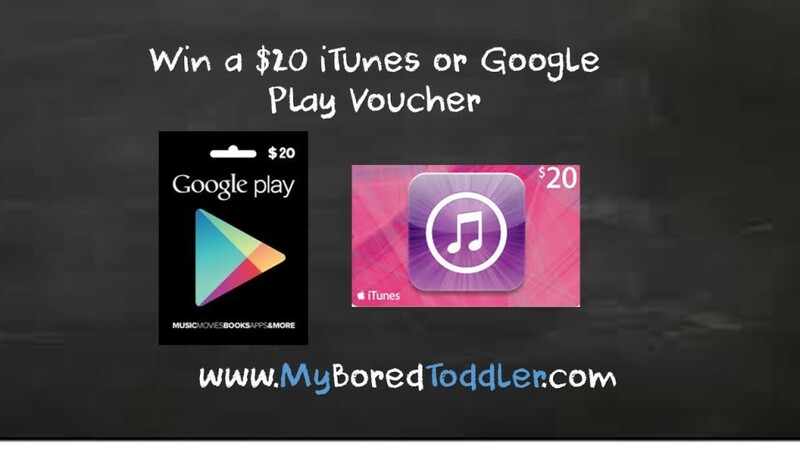 Win a $20 iTunes or Play Store Voucher! Best Apps for Toddlers! Win a $20 iTunes or Play Store Voucher! We are on the hunt for the best apps for toddlers! My toddler loves playing on a tablet or iPad (in limited, supervised sessions) but it is always hard to find quality apps that are age appropriate, educational and not full of ads and spam. With so many apps to choose from it is difficult and time consuming to find a list of great apps for toddlers. We thought we would ask the experts – You! If your toddler has an app that they love (free or paid), we would love you to share it with us. We will compile a list of your answers and review some of the most popular ones in the coming weeks. Everyone who tells us their best toddler app will also go in the draw to win a $20 voucher for iTunes or Google Play Store so they can enjoy some of the recommended toddler apps. Tell us your favorite toddler app in the comments below and then enter via our Facebook page. To win you MUST be a current fan of our Facebook page and have left a comment below. Good luck! Filed Under: Best Apps for Toddlers, Win! Thanks Kristina – that sounds like a very useful app and very popular if it includes Elmo! Thanks for sharing. That’s a great suggestion – even better that it’s free! My daughter loves this one too. Another free one with no ads – that’s always great! Thanks for the suggestion. This is a great series of apps – very educational and lots of fun! I love the ABC for Kids app. It comes in very handy when we have to sit in waiting rooms. This seems to be a very popular app! This is a whole series and they all look great! Now to decide which one to try first! My 2 and 4 year old cousins love the ABC Song – All in One Educational Centre app. Saw them using it the other day during a thunderstorm – something neither of them like – and it kept them occupied and entertained the whole time without any screaming. It was great. Highly recommend it. Thanks for sharing – it looks like a great app and another free one which is always nice! Thanks for sharing. I love Sesame Street – such a great educational show and their apps are always great. Thanks. Disney is always popular! This looks great for the younger toddler. I love music apps. Thanks for sharing! Thanks – sounds like a fun game! The Cbeebies app is excellent! Thank you! Cbeebies has some great programs. My niece loves to play DRAWNIMAL. She is super creative! Thanks for sharing. It looks like there is a free lite version of this so people can try it out before buying the full version. I use and like speech with Milo, my little man really likes Milo. I know a few Speech Therapists and they all rave about these apps too. Such great apps, especially if your toddler is behind in their speech (and even if they aren’t!). Thanks for the great toddler app suggestion. Wow – this looks like a great range of educational toddler apps. I can’t wait to check them all out. The Peppa Pig ones are really popular! I love the Peppa Pig Paintbox app. You can read our review here and it is a FREE official app. Thanks for the suggestion of a great FREE app! Do you have an app lock on your phone? They’re great, as they put a pin lock on apps of your choice so that your toddler can’t access them and most are free. This is the android one that I use, but I’m sure there’s one for an iPhone/iPad as well. Mine likes the ABC For Kids app the most. This is definitely proving to be a popular app! Thanks! Another popular show for toddlers – I’ll have to have a look at the app. The Room on the Broom app is fun! Thanks for sharing your best toddler app. I hadn’t heard of this one before so will have to go and have a look. DRAWNIMAL. She is super creative! DOWNLOAD: iPhone/iPad for my niece. We love Mister Maker too. I wasn’t aware there was an app – it looks really good. Cheap and no in app purchases! I like the Peekaboo Barn app. This company make some amazing apps for toddlers. They are paid apps, but definitely worth the money. I notice this one is currently on sale if anyone else is interested. Thanks! Any toddler app that makes toilet training easier gets my tick of approval! Thank you! Dr Seuss is great for toddlers – can’t wait to have a look and check it out. Thanks. The free version looks good, with a lot more great songs on the paid version. I love that this one is free and you can watch all the different episodes. Great for those long car trips! This one looks great! Thanks for sharing. Funnily enough, my 3-in-April’s favourite app on my phone is HEADSPACE, a mindfulness meditation app! It has great animations and a very soothing voice! Interesting app! I like that it’s free and it makes a change from the usual lullabies which drive you a bit crazy after a while! Best app for toddler is called “a teddy bear.” It does not even require an electronic device, it stimulates the toddler’s imagination and social skills, and it never needs recharging! So true! I do agree that traditional toys are best and that technology should only be a very small (supervised) part of a child’s play. youtube app…. only because when I have an appointment I put on either Thomas, Peppa, Giggle and hoot or In the Night Garden and he sits there and watches it. If I had an Iphone I would use the ABC app, however google does not have that. Yes, Youtube is definitely a favorite! We have viewed many hours of The Wiggles and Sesame Street on that app! We LOVE LOVE LOVE baby visual for the youngest. So stimulating! What a great idea for an app. Thanks for sharing! Thanks Melissa. The Starfall app is great – I know a lot of teachers that use the Starfall programs in their classrooms. They are great for reading skills. My son loves playing the Baby Chef App. He loves showing me foods he can prepare! Great toddler app! I’ve just downloaded the free version and it looks really good! Thanks for sharing your favorite toddler app! My toddler loves color dots! Thanks for sharing your best toddler app Whitney. This one looks really good. In our house so far the ABC for Kids app is the favourite! This is definitely the most popular app for toddlers so far! Toddler Lock. Free and fun for kids. A toddler lock is a MUST! My daughter likes Paw Patrol Rescue Run. I’ve notice this app is very popular. It’s currently on sale from the Amazon app store here if anyone is interested. Angry Birds Seasons. Classic Angry Birds for any age! Some of the newer versions are too hard for my toddler, but she loves the Seasons! New levels come out often, keeps it interesting for me as well! Thanks. I love this one for toddlers too! This elmo app certainly is popular! Peppa Pig is a hit here, we have a couple. Thanks for sharing. Peppa sure is a popular pig! my 3 year old loves alphabet and numbers apps this is awesome! Thanks Amylee – another great toddler app suggestion! http://www.storylineonline.net/ Celebrities reads story books to kids. Awesome! Yes, that’s a great app for toddlers. It’s one of my favorites. You can read our detailed review of it here. Thanks! Where would we be without the ABC! ToonTales is a great app for toddlers from colouring, puzzles, game to music. My son loves it. We bought the TOCA kids bundle and my kids love it. These look like great apps. Thanks for sharing them with us. Clash of Clans, very addictive game! Thanks. This is a very popular app – great for toilet training your toddler! I find Starfall is one of my son’s favorite apps & the games are educational & fun for him. He has special needs with minimal speech & he adores Talking Tom also. So whatever sounds my son makes, Tom repeats them, & it becomes an interactive speech experience. Thanks Darby. That seems to be a popular toddler app. I agree about limiting screen time, which is why it’s nice that everyone is sharing their favorite apps. My favorite app is Five Little Monkeys! Your child can learn to sing the song along with pictures. Definitely deserves to be checked out! You can never go wrong with any app that showcases “Winnie The Pooh”. My nephew’s favorite is “Pooh’s Birthday Surprise”. My little guy likes the Kids Sight Words app. Storyline online: Celebrities read books to kids. I love that they are real books and that so many readers are men. Wonderful modelling for kids. Our toddlers can find it, chose a story and listen with no help now. My son loves the PBS Kids app. My girls like PBS kids and Nick Jr.
Our little ones love endless reader almost as much as I do when we want 5 minutes to ourselves. Its free and educational and sometimes we play with them. I have to agree with the ABC 4 Kids app. I can’t get my 3yo away from the tablet! I like Kidoodle TV for watching shows and a fun with phoinijcs one. Leap frog maybe? It’s a game that is easy enough for little ones, but has the message of rail safety behind them and helps a bit with hand eye coordination. My toddler loves Baby’s Musical Hands. One of my favorite apps is called Little Reader it’s a comical but top rated app for children to learn how to sound, prou ce and spell words and letters. The little cartoons to demonstrate the words is cute. All Kids Can…Do The Laundry! My son loves “Ninja Fruit”! Cbeebies = a brief peaceful space! My niece loves the App – Eli Explorer. It’s a free interactive app that teaches toddlers new words and phrases in a fun way. Thank you for having this giveaway and the chance to win. My grandson loves the fireworks app. He also loves his virtual dog Boo on Virtual Pet. My daughter loves Disney Princess Storybook Dressup and Where’s My Water. She has another one that she guessed the bird to the sound and she’s played it so much that she knows each one. It’s amazing! Birds I never heard of! And they say electronics are bad for kids lol! Starfall is a really fun app. I love iStory Time for my little one. My toddler’s favorit games are educational games by Learn o’Polis. Fun and kid-friendly games with simple and clear user interfaces and without ad interruption!